I’ve been cooking for years, and being a proud Southern cook, I’ve smothered my share of pork chops and chicken. Last weekend, however, I realized that “smothering” is very similar to (if not the same as) braising. This month’s Bon Appetite (Oct. 2007) features these short ribs, and after cooking them, I totally see how they made the cover. Everything comes together at the end. The ribs cook away in two bottles’ worth of Cabernet for a few hours until they are falling off the bone. 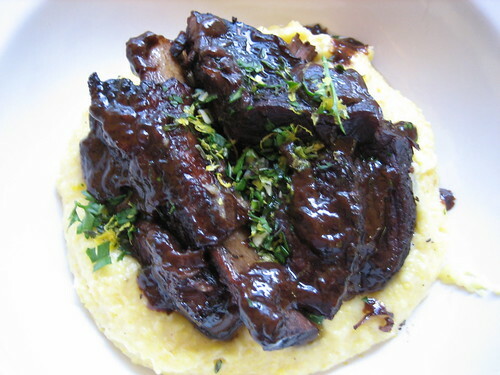 The wine imbues the meat with a deep, rich flavor – and it makes a nice reduction at the end. We served it over the magazine’s recommendation of Gorgonzola polenta, but to be honest, I didn’t care for it. To be fair, I’m not a huge fan of blue cheeses. Next time, I am going to serve it over my Roasted Corn Grits. That will make it perfect. Even though I didn’t love it, the polenta was okay. I’ll post about it tomorrow. Bridget actually said it was better the next day. “Not as blue cheesy,” Bridget said.